Featuring Nelson & Sergeant Secker on the quarter deck of the of HMS Victory. The kit contains 23 parts including a section of deck, plus full painting instructions. Sergeant Secker of the Royal Marines goes to the side of the fallen Nelson. Secker, aged 24, was the first person to reach the stricken Nelson and assist him down to the orlop deck. 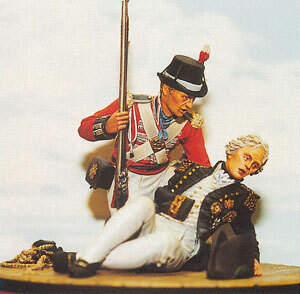 Nelson had been hit in the left shoulder from a musket shot fired from the mizzen top of the French ship Redoubtable. The admiral died from his wound some hours later.